Although over the years I had maneuvered in and out of restrooms and occasionally wheeled myself around department stores and such, it hadn’t even crossed my mind to go for a “walk” with my husband and our dogs around the block. This brought about a whole new challenge…regardless of the textured Hatch wheelchair gloves I was using, I could NOT manage to get a grip on the push rims to propel myself up the slight incline; even worse, I was unable to stop myself from racing along what I would have thought to be a minimal-for-walking-folks slope grade. Thank goodness my husband was there to grab my wheelchair and keep it from careening down any farther and dumping me onto the pavement once it hit level ground! When we finally returned home, I was determined to find a reasonable solution (my husband advised against me sanding the push rims to rough them up LOL!) 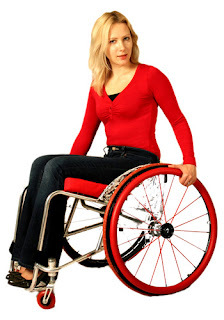 I was certain countless others were challenged with the following: basic push rims which looked really smooth and pretty (by manufacturer’s standards) but were not the least bit functional in real life…us wheelchair users need grip, people! I called many local mobility supply shops and they suggested a new pair of gloves. Ha! I knew that would not be remotely enough and thankfully stumbled upon the RehaDesign Ultra-Grrrip Pushrim Covers. I reached out to RehaDesign with some questions I had and was incredibly grateful for the sincerity and promptness Galina responded with. Now those are two qualities I look for when doing business with someone but rarely find! These covers were just the miracle I was in search of and will absolutely be life-altering. I haven’t even had them on for a week and am already in love! What seems like such a simple solution is extremely difficult to come by and completely unknown in the mobility supply world here in the western United States. I feel a sense of obligation to my fellow wheelchair-using community to get the word out…there IS indeed a reasonably priced and super simple solution to gaining the ability to safely venture out unassisted and start living life. Freedom…we’re comin’ for ya! Here’s to a whole new realm of possibilities we never dreamt were feasible! I would give Galina a great big hug if I could! Next step…spreading the excitement for and functionality of RehaDesign’s covers! Give your wheelchair a little pizzazz like I did and purchase at http://www.rehadesign.com/products/wheelchair-pushrim-covers!